Digging cats. It normally means they’re doing something horrible in your garden. Not today though, because this CAT 434E backhoe is something rather wonderful. 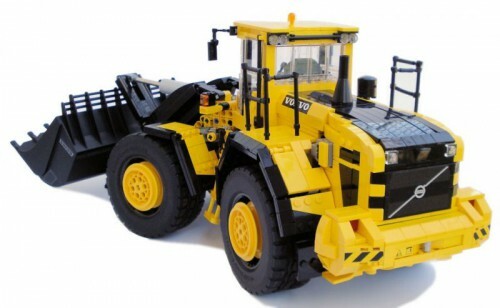 Built by Zbiczasty of Brickshelf it’s near a perfect functioning replica of Caterpillar’s real 4×4 backhoe, complete with no less than fourteen working functions. The all-wheel-drive is remotely controlled, including remotely operable pneumatic differential locks, pendular front suspension, and three steering modes (front, all, and crab), exactly as per LEGO’s own brilliant 42054 Claas Xerion 5000 tractor set. Of course there’s a working front loader – also powered by remotely controlled pneumatics – with both bucket and boom movement, and a fiendishly complicated pneumatic backhoe with five different movements from elevation to slewing. Finally there are pneumatic stabiliser legs mounted at the rear and a suite of LED lights. It’s a remarkable machine and one of the most realistically engineered Lego creations that we’ve ever come across. 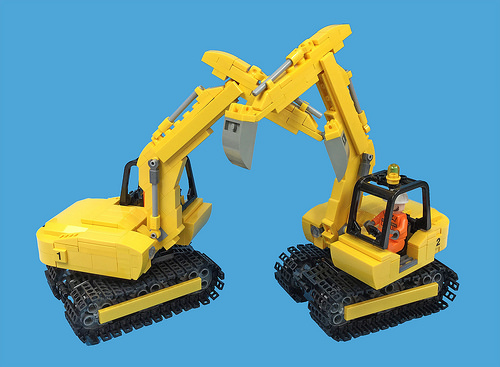 There’s a whole lot more to see of Zbiczasty’s Caterpillar 434E backhoe at the Brickshelf gallery via the link above, but the only way to really appreciate how well this model works is to watch it in action – check out the video below to see just how good it is. Regular readers will be all too aware of how our workforce enjoy using their finds of Lego machines to attack and smush each other. Unfortunately it looks as though this sort of behaviour is spreading, as witnessed here in Gary Davis’ Duelling Diggers. You might have noticed that we haven’t been posting as frequently as we normally do at The Lego Car Blog. The Elves have been struggling to find suitable MOCs and have started to look a bit hungry. Fortunately we’ve been able to give out a shiny yellow Smartie today, thanks to this yellow monster from Marek Markiewicz. The lucky Elf has kindly split his reward with his colleagues but a single Smartie will only go so far between 213 Elves. Hopefully they’ll find more MOCs in the next few days, or we might have to actually feed our workforce for free. 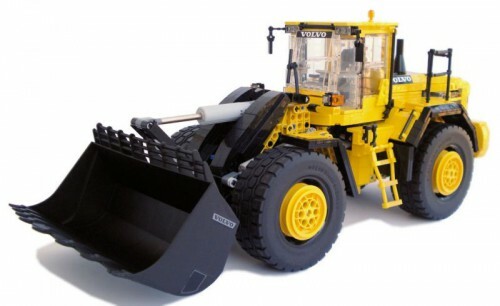 Marek’s Volvo L250G is built at 1:20 scale, using the bucket from the 42030 Wheel Loader and is even more impressive than his previous Liebherr L580. It’s beautifully detailed, including fully glazed instead of implied windows on the driver’s cab. The loader is also fully remote controlled, via two IR receivers with an L motor for traction, an M motor for steering and L & M motors to control the bucket. You can see full diagrams of the internal working of Marek’s loader by clicking this link to its MOCpages listing. Marek also has an impressive back catalogue on his Flickr Photostream. N.B. In an attempt to be more environmentally friendly, TLCB has started recycling. We’ve already used this title twice before. Cut and paste it into the “Search” box, at the bottom of the page, to find out where. This smooth looking rig was built by drdesignz on MOCpages. Its builder cites the 7347 “Highway Pickup” as an influence on his design, though the lowboy trailer is rather more stylish than the back of the Creator set. On top of looking good, the model has plenty of playable functions, which always excites the Elves. 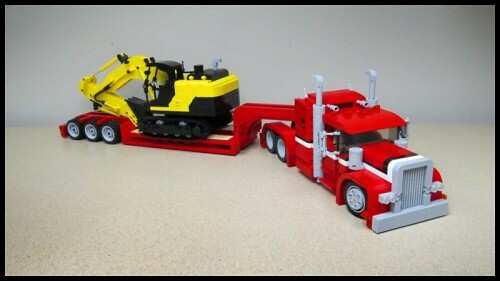 The trailer detaches, the digger is playable and the truck steers. As its builder notes, the steering works in the same way as the Model Team 5580 “Highway Rig”. The Elves were also excited because this MOC reminded them of when they helped us build the 31005 “Construction Hauler”, plus it features another digger with which they can smush their colleagues. You can see more of the truck, trailer and digger by clicking the link to MOCpages or Cuusoo. Next up in today’s post of unusual construction equipment is an armoured bulldozer being driven by a cat. No further explanation needed. See more at Lego Junkie‘s photostream. Time for some more Technic, and today we’re getting it by the bucket-load (hah! ), with this old-school Skid Steer Loader by Bobofrut. 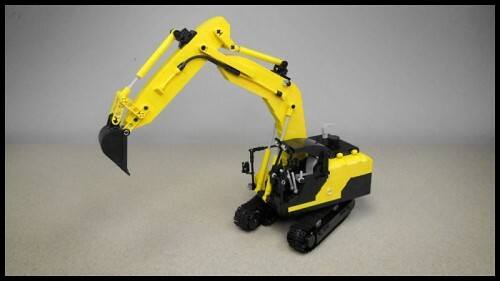 It’s fully remote control, being powered by LEGO’s ubiquitous Power Functions motors, and the bucket both raises/lowers on its arm, and tips. See more on Brickshelf at the link. Caterpillar PL-87; the world’s biggest claw machine. You should see the size of the stuffed animal. This month’s Featured TFOL hails from MOCpages, where the Elves spotted him via his rather excellent construction equipment. Jon Treasure started out not too far from ‘minifig-on-a-plate’ type builds (ergh – we know), then rapidly moved through medium scale military and vehicular builds. He’s now reaching the heights of super-complex large scale Technic creations that any AFOL would be proud to create, like the awesome Caterpillar PL-87 pictured above. Check out his MOCpage at the aforementioned link, it’s well worth a look.